Palmway Locksmith is the number one locksmith company in Corona, CA providing Corona residents with consistently quality and highly affordable residential locksmith services 24 hours a day, 7 days a week (including holidays). Our company is dedicated to providing our customers with the locksmith services they need in 30 minutes or less. We also take pride in having one of the most affordable service rates in the area. Our residential locksmith services are provided to our customers to further strengthen the security of our customers’ homes. We guarantee that the excellent handiwork of our professional locksmiths, as well as the top-of-the-line equipment we use, will endure for a long time and will ensure our customers that they are safe for their peace of mind. We are aware of the increasing cases of crimes around Corona, involving robberies and break-ins of homes and private properties. With this in mind, we urge all homeowners to have their locks and doors checked to make sure that they are all still working well—if you find that one of your locks have been jammed or your garage door has been rusted due to years of use, we advise that you call us immediately. We’ll take it from there and let you know whether your doors and locks need repairs or replacing. 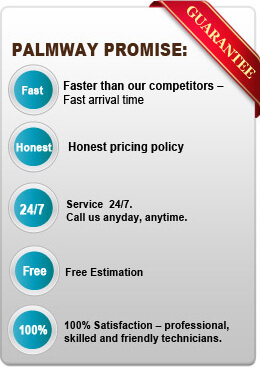 For quality residential locksmith services on the dot, call Palmway Locksmith now! Our dedicated and licensed locksmiths are always glad to serve the local community of Corona. Here at Palmway Locksmith, we guarantee that you’ll only be getting the type of high-quality service you deserve. Furthermore, our phone line is open for any comments, questions, suggestions, or concerns from our valued customers in Corona. If you’ve recently availed of one of our locksmith services, ring us up and give a review! Help us serve you better.